We love our Crestview Condo! Come stay in our lovely family newly redecorated condo and your family will love it too! Please inquire to recieve a quote for your stay. This Top floor Corner unit has 2 bedrooms plus loft and 2 ½ baths. It is first off the elevator and has parking space close to elevator so you won't have far to go with your luggage. It overlooks the pool, spa and has views of the Mountains, Olympic Ski jumps and High Ute Ranch. It is close to the clubhouse, pool, Jacuzzi and work out room. This spacious corner unit sleeps up to 6. The condo features a private deck and includes an assigned parking space in an enclosed heated garage, with a large private storage closet for all of your equipment. It is walking distance to great shopping at over 60 popular outlet stores, and only a short drive from Salt Lake City airport. Close to all major ski areas. This privately owned family friendly 1500 square foot condominium has all the comforts of home. Flat Screen TV with Netflicks in main living area. TVs in both bedrooms. A Beautiful kitchen with granite counters, all appliances including refrigerator, dishwasher, gas range and microwave. The master bedroom has a King bed two walk in closets and private bath with an oversized tub; double sinks and built in hair dryer. The loft has two extra long twin beds and movie area for the kids, reading nook and a full bath. Upstairs bedroom has a queen bed and a walk in closet. There is a washer/dryer for your convenience. The unit is equipped with central air conditioning for the summer months and central heat and a gas fireplace for winter. The pool, Jacuzzi and play area are in view from the balcony. If you like to work out, there is a gym with machines in the Clubhouse. A walking trail behind the units leads over to the outlet stores in one direction and over past the scenic Hi Ute ranch in the other. No Smoking, No Pets. Security Deposit Required. 'Book it Now' with Credit Card. I would love to tell you all about our condo and answer any questions you may have. Monthly Rental: Includes all utilities including internet, basic cable TV. $250 Fully Refundable Security Deposit Required. Family Friendly Condo! We love to spend time at the condo with family and friends. Here is our precious grandaughter having a great time in the snow outside on the deck! We love Park City, Utah!. Crestview’s location at Kimball Junction has the best of everything for our family. It's close to all three major ski resorts and just a 40 min. scenic drive to several others. Several grocery store options are nearby for a quick trip to the market. We are walking distance to the Outlet mall. Redstone shopping center just across the way has shopping, dining and a movie theater. We love the security and amenities the property offers. Great views of the mountains all around and views of the olympic ski jumps. One Internet telephone for your convenience located in the master bedroom. Please note if Internet goes down phone will not work so please have your cell phone handy for emergencies. One assigned space inside heated garage. Secured high speed wirless, so bring your laptop! 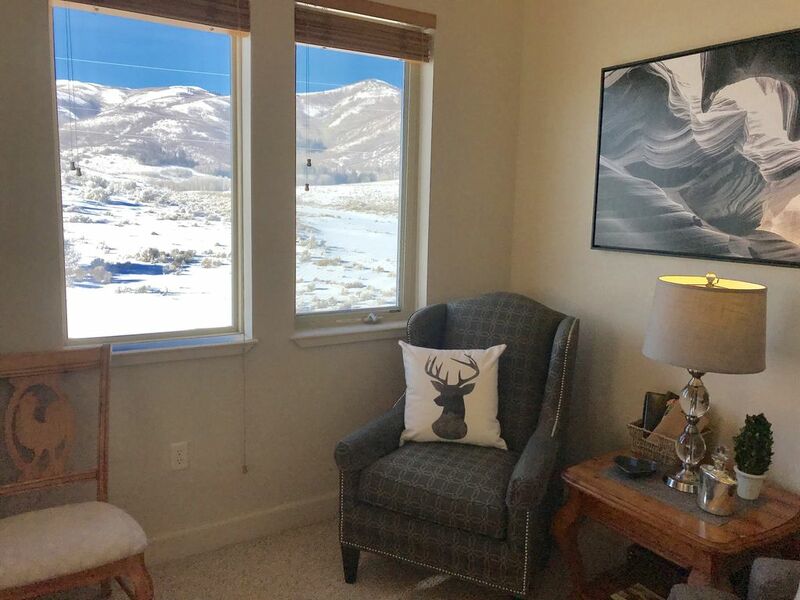 Mountain Views from every window. Large, Corner Newly remodeled Family Friendly Condo w/new carpet. Close to pool, spa & fittness center. King bed in master down, Queen & 2twins up. We loved the accommodations and thought its location at Kimball Junction to be the perfect mix of near Park city slopes as well as the cottonwood canyon resorts. Plenty of room, well furnished, clean and Kathy was excellent to work with. We will be back!! Great condo. Had everything we needed and plenty of room. Indoor parking and unit is a short walk from the hot tub. 10 minutes drive to Canyons. Thanks! The condo is actually more spacious than the pictures show. Third floor, end unit was quiet, and the view looked up to the surrounding mountains. Five minute or less drive to Whole Foods, Walmart, lots of outlet stores, and local restaurants. Located in the Kendall Junction area, the drive to The Canyons, Park City, and Deer Valley resorts was pretty quick. Bus service (stop) is also right up the street. For 2 families totaling 6 people, this condo was an affordable alternative to the expensive properties located at the resort areas. Condo came with a working washer/dryer which is always a plus. Any issues were remedied by the owner within a reasonable time frame during our stay. This property was wonderful! The views were great, the condo had everything I needed for an extended stay, and the owner was always available to answer questions. Condo is just as advertised, only better.
. Over the years I have rented many condos in Park city. This condo is the very best. It is very comfortable and the location is great. I will be looking forward to returning. Bev, thank you for your kind review of our condo. I’m glad you enjoyed your stay and that we exceeded your expectations. You were one of the first guests to be there after our remodel and I’m extremely happy that it was so well received. We would love to have you back as a returning guest. This condo had everything we needed to enjoy 2 months in Park City from April to June. It is very spacious and comfortable. It has amazing views and is in a great location. We especially enjoyed the walking path directly behind the condo. We definitely want to go back! Balance in full due at time of reservation. Fully refundable security deposit for damages of $250.00 required. Cancellations made 45 days in advance will be refunded. A $65.00 fee will be retained from any refund. Check in after 3pm on Arrival Date-Check out by 10am on Departure date. *Any reservation obtained under false pretense will forfeit all money. *Must be 25 or older to reserve unit.